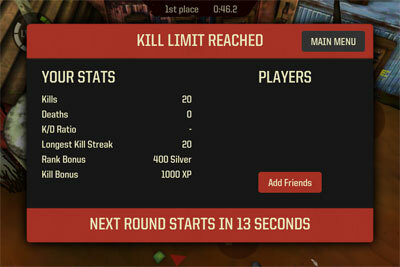 The free-for-all deathmatch is a type of online game mode that allows a maximum of 4 players to fight against each other. One can play with random players worldwide or with their Game Center friends. Playing with Game Center friends does not reward a player with silver or experience points. The deathmatch maps features a lot of buildings, obstacles and covers for one to dodge the shots from other players. There are also many barrels in the area. When one kills 3 people in a row, he is considered to be on a streak. When one dies, he has to wait for a respawn. Every player would respawn with a shield activated. The game ends whenever the time limit or kill limit (20 kills) is reached. At the end of a game, a player receives a small amount of silver depending on his rank in the game. Before you enter a deathmatch game, make sure you have good guns and armor as the other players would have one also.